"I really miss our Monday morning coffee and doughnut get..."
"Alan & Eric: All the Herrick are standing tall for your..."
"So sorry to hear about John, I think of him often and would..."
"Eric & Alan: We were former neighbors on 94th street. Your..."
"Alan & Eric: Your father was a wonderful man as you both..."
John Andrew Beck was born in Lueders, TX. As a toddler, his family moved to the Vancouver, WA area, where he passed away in his 97th year with his active mind and firm handshake still intact. “JB”, as he was known to most, went to Benson Boys Polytech. After serving in the Army in WWII, he attended Reed College and graduated with a degree in Physics. In his varied career, he worked as a FDA inspector, pharmaceutical rep, residential developer/builder, city plans examiner and was a regular family croquet champion. JB was an avid reader and close follower of current events. 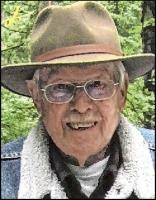 He enjoyed target shooting, playing cards, dancing and taking road trips. JB was married to his bride, Helen Wright, for 57 years, until her death in 2004. He loved his family and was so appreciative that everyone got along well. He was most proud of his “boys”, as he called his sons. JB is survived by those sons, Alan (Anita) and Eric (Daphne); grandchildren, Kyle, Connor, Sydney and Carly; great-granddaughters, Elin and Quinn; niece, Linda; and dear companion of 14 years, Virginia. JB was a man of integrity and humor, and will be missed greatly by all of us. In remembrance of JB, please contribute to your favorite local charity, stand up tall and be kind.